The 345 horsepower, turbocharged V10 diesel of the Touareg R50 is marked by a massive torque level of 627 lb-ft (850 Newton-meters) developed at a low 2,000 rpm. 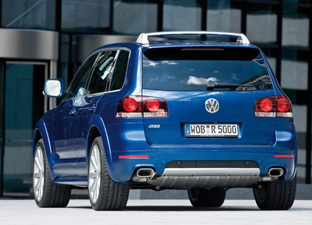 This gives the Touareg R50 a 0-60 mph time of 6.7 seconds, and a 146 mph top speed. In keeping with the performance figures of the Touareg R50, Volkswagen designed new exterior and interior features according to the R philosophy. 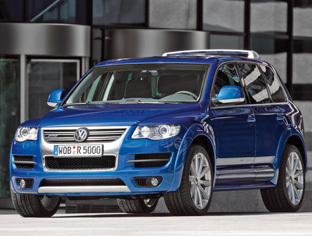 From the outside, the Touareg R50 is easy to recognize with its 21-inch Omanyt type alloy wheels and size 295 tires, blue painted brake calipers, discrete wheel well flares, side skirts and distinctive bumpers (Sport Design Package), as well as a modified radiator grille (in a matte finish chrome). The VW Touareg R50's extensive features also include an air suspension sport chassis: The so-called "Driving dynamics package with adaptive roll compensation" and chassis lowered by twenty millimeter supplements the "Sport" mode of the manually or automatically controlled air suspension by achieving a stiffer spring rate. 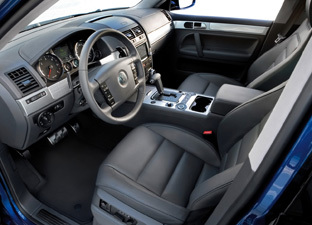 On the inside, the Touareg R50s features include a sport seating system in anthracite-colored nappa leather with R50 logo integrated in the headrests. The logo was also integrated in the stainless steel tread plates. Also in keeping with the sporty character of the Touareg is the light-colored "engine spin" decor of the interior  a metallic structure similar to that previously used on race cars  as well as metal worked caps for the accelerator and brake pedals. A R50 logo also decorates the gearshift lever of the six-speed Tiptronic automatic transmission.